The City of Nottingham is the first City in the UK to declare a zero-tolerance stance on Female Genital Mutilation (FGM). The motion was passed at a full Council meeting today (12 September) after Sheriff of Nottingham,Councillor Jackie Morris, proposed the motion. Councillor Morris has been working closely with Alfreton Road-based group Mojatu Foundation to highlight the issue in an attempt to help end its practice in the City. It is believed that over 60,000 women and young girls are at risk of FGM in the UK alone. Mojatu Foundation will be tackling the issue of FGM on a national level at Nottingham in Parliament Day on October 25. Their panel discussion, which forms part of the Global themed events, will use Nottingham as a model to follow and address the need for accessible service provisions that meet the diverse and complex needs of survivors. There will be a focus on mental health service provision and the legal protection of girls at risk and how research can help to fill the knowledge gaps. This Council notes that Female Genital Mutilation represents a risk to physical health, mental health and quality of life for young women across the whole of the United Kingdom. It is believed over 60,000 people are at risk of this abuse in this country alone. • Make Nottingham a “Zero Tolerance” City in respect to Female Genital Mutilation. • Work to end the procedure within the city by working closely with survivors, affected communities and other agencies with a responsibility to safeguard and protect. • Provide training for staff to help spot the signs associated with Female Genital Mutilation. • Work closely with grassroot organisations, survivors and communities to prevent children being removed from the city to experience Female Genital Mutilation. • Help support potential survivors of Female Genital Mutilation to say no and raise awareness amongst their peers and communities. • Help with raising awareness and keep the subject on the agenda while showcasing the successes of Nottingham. • Support the establishment of a referral pathway for the City. Well done all and to Nottingham City Council for being the first city in the UK championing this vital cause which is child abuse. 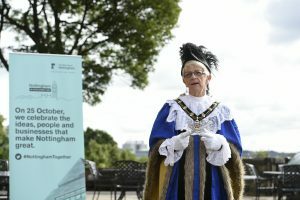 Nottingham in Parliament Day is an annual, one-day take-over of Westminster - showcasing and celebrating the institutions, businesses and people that make Nottingham great. All the latest news and stories linked to the day will feature here.